Enjoy the real flavor of Valencia oranges. From the tree to your table in 24 hours! Place your order now! 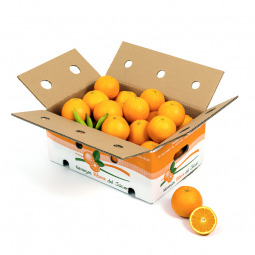 We craft the most delicious oranges for you, oranges and natural clementines, fresh and juicy. The Magraner family is dedicated to orange cultivation for more than 150 years. FREE SHIPPING with your order. Online sales From the tree to your table in 24h! Give Health The perfect surprise! Our Juice Oranges are medium sized and high quailty. They come out in 10 Kg boxes, for easy handling. They have big amount of juice content, and their smooth pulp have a great intense orange colour making them very attractive. As all of our varieties, they have no seeds inside. We focus on harvesting them at their optimum sweetness and growth time. 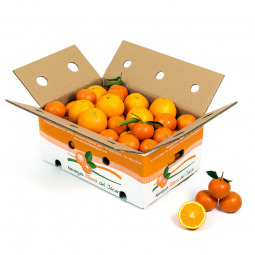 Our Juice Oranges are medium sized and high quailty. They come out in 15 Kg boxes, for easy handling. They have big amount of juice content, and their smooth pulp have a great intense orange colour making them very attractive. As all of our varieties, they have no seeds inside. We focus on harvesting them at their optimum sweetness and growth time. 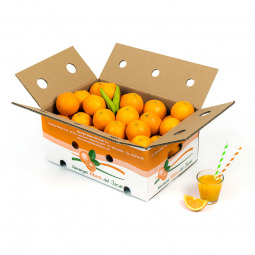 This box contains 5 kg of sweet and refreshing tangerines and 5 kg of Table oranges with smooth pulp and big sized, containing also a big amount of juice inside. Tangerines, very convenient to eat, as their peel detaches easily by hand. Table oranges, well suited to be enjoyed during breakfast or desert. They also offer great amount of cooking possibilities. Welcome to Naranjas Ribera del Júcar. 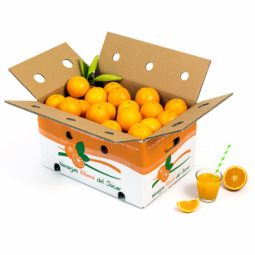 In our online shop you can buy Spanish oranges and tangerines from Valencia quickly and safely. We have the best quality table and juicy oranges. The Magraner family dedicated since more than 150 years to the cultivation of orange trees in La Serratella, where we pack by hand the most delicious oranges for you. Our boxes are a great idea as a gift. You will surprise your family, friends, customers and employees with this premium present containing fresh oranges and tangerines. We send our fruit directly to your home so you can health care and enjoy it within 24 hours if the destination is inside Spain (or 72 hours if it is in another country) by a fast and efficient transport. Carcaixent (Valencia), located in the Upper Riverside of the Jucar River, is one of the most beautiful and fertile areas of Valencia. 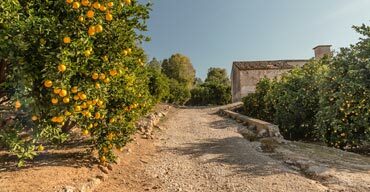 Due to its wonderful land and its privileged weather, it was the place chosen to create the first orange grove in our country, receiving since then the nickname "Cradle of oranges”. Our philosophy is to give the best of ourselves and our fields. We select only the best oranges and clementines: getting that sweet taste with a wonderful appearance, presentation and size. We'll get a smile when you taste our oranges.filosofía es dar lo mejor de nosotros mismos y de nuestros campos. Seleccionamos para ti exclusivamente las mejores naranjas y clementinas: consiguiendo ese sabor dulce con un toquecito ácido tan delicioso, aspecto, presentación y tamaño. Te sacaremos una sonrisa cuando pruebes nuestras naranjas. We onl send seasonal fruit (from November to June). 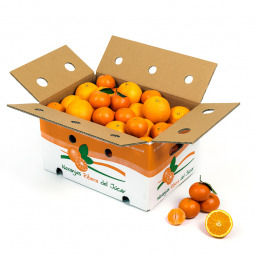 Directly from the field to your home within 24 hours so our oranges and clementines are fresh and juicy. Just in its best momento to retain all properties and flavour. Our product is 100% natural. No industrial or manufacture process are used so it never goes through warehouses, cold, or receive subsequent treatments waxing, etc. It's as if you yourself pick your own fruit in the grove. We care for your Health! Imagine how convenient it is to open the door and ... presto !! Oranges already at your home avoiding you to go to the market many times with heavy loads. 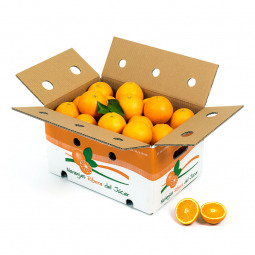 To buy oranges and tangerines from Valencia at Naranjas Ribera del Jucar is a wonderful experience!